Multiple family activities take place in the living room. 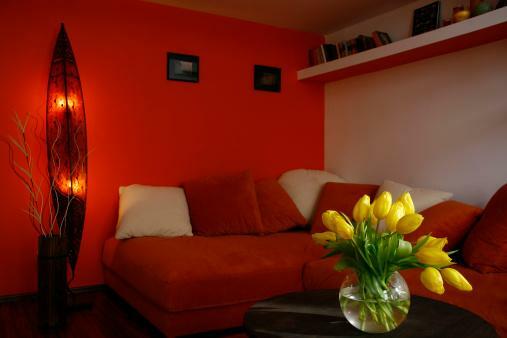 Feng shui addresses the best way to enhance these energies with color. Pay attention to where your living room is located and decorate with colors compatible with the compass direction of the room. Southeast and east sectors are governed by the wood element and in the productive cycle, wood is nourished by the water element. You can use blue and/or black (water element colors) along with green and brown (wood element colors) for a balanced chi decor. Paint your room a medium to dark blue. If you don't want blue walls, select an ecru and opt for blue curtains, a blue rug, and a couple of blue upholstered furniture pieces. Another upholstery and/or drapery choice is a brown and blue combination for a stunning feng shui décor. Other color combinations include, green and brown or blue and green. Pictures of a lake, pond, or meandering stream provide appropriate colors and the right kind of water theme (never use pictures of turbulent oceans or rivers). The red (fire element color) energizes. If your living room has high energy activities, you might go with a less energizing color, such as melon or pale tangerine. Add various wood element colors, such as brown and green, to fuel the fire energy in this sector. A combination of green and red or red and brown can be found in plaids or floral fabric patterns. Add wall art that depicts these colors in various themes. Earth element colors, such as tan and ochre, can exhaust some of the fire energy for a more relaxing ambiance. Tan and ochre represent the earth element assigned to both sectors. Highlight ochre or sunflower colored furnishings, such as draperies and upholstery choices. Select a patterned fabric for the couch or a pair of chairs that feature these colors. Use yellow accent colors for art and décor accessories, such as decorative objects, throws, and pillows. Northwest living rooms colors include gray, white, and black. West living rooms benefit from stronger metal element colors such as, gray, gold, yellow, bronze, and white. In the productive cycle, earth produces metal. Select gray as the main color with earth colors, such as tan and ochre, as accent colors. 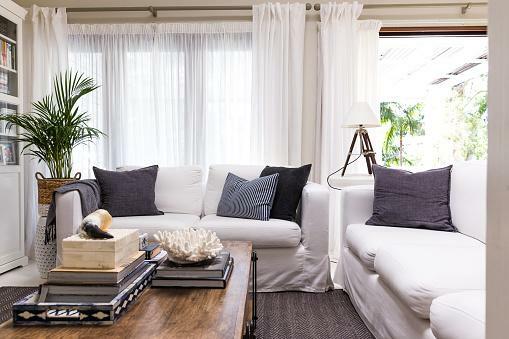 Go with a light gray for walls and an off white for trim. Add a gray couch with gray and yellow patterned throw pillows along with a couple of darker gray pillows and a couple of gold/yellow accent pillows. Ochre and gray plaid curtains repeat the accent and metal colors. Continue repeating the accent color while adding a few white or gold objects. Gold, ochre, white, and/or silver photo and picture frames carry the colors throughout the room. The water element rules the north sector represented by black and blue. You can add one or more metal element colors to reinforce the yang energy, or if you need to calm down the activity in this room, add a few wood element colors, such as green and brown, to exhaust some of the water's yang energy. You can use the same color combinations described in the east and southeast sectors. Black accent colors can reinforce the yang energy if needed. Black and blue fabric patterns, such as plaids and stripes, can be highlighted in throws and pillow choices for solid blue or black sofas and/or chairs. You may choose to use a milder color palette of light blues and grays. 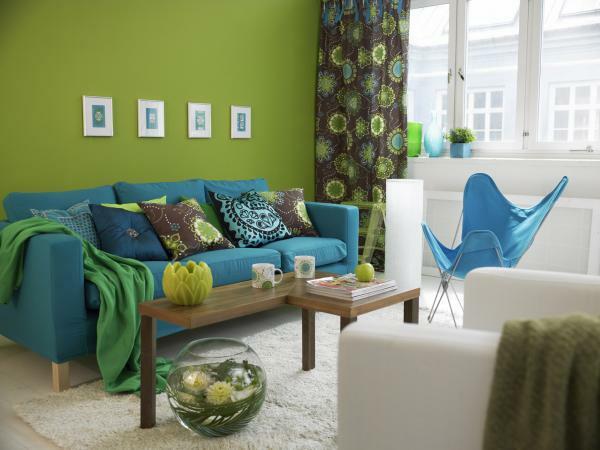 The best way to select feng shui colors for your living room is to use compass directions and their assigned colors. If you feel the colors create too much yin or yang energy, you can always counter by introducing an accent color of the opposite chi energy.